Hi loves! How are you today? I am finally trying to get some swatching done. It has been SO hot here and my "polishroom" has sun on it all day.. you can imagine it feels a bit like my private sauna here. But we got a little ventilator and now it is okayish to sit here. What I've got for you today is a polish I ordered a little while ago, called Too Fancy Lacquer Forest Fairy. Too Fancy Lacquer (from now on TFL) is a new indie on the block based in Hong Kong. The mastermind behind TFL is Carmen and it seems she loves this blog ^^! Hi Carmen *waves*. I am not even sure how I found out about her or her polish brand, but I did order 2 varnishes from her during her opening sale. One being Forest Fairy, the other Royal Jeans. All polishes are 3 free, made by herself and created with cosmetic grade pigments, colorants and bases. The bottle is a square one and they hold 12ml. The size is comparable to Essie bottles. The brush is flat, not too wide and spreads out nicely. I personally prefer round brushes but the quality is good so that's great. I'll admit I was a bit surprised by the polishes when they arrived, as they did not quite look like what I expected. Especially Royal Jeans is much dustier compared to the pictures in her Etsy shop. I also don't think they'll be opaque in 2 coats on their own. 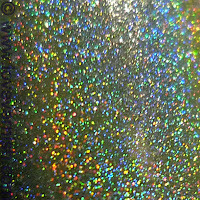 Forest Fairy is more of a greyish holo in the bottle, but on the nail you can definitely tell it is a mossy, darker green color. The holo is great on these! I chose to layer 2 coats of TFL Forest Fairy over 1 careful coat of China Glaze Westisde Warrior, to be sure I wouldn't have any VNL. I reeeeally loved the endresult! The basecolor brightened it up a bit but it still got quite dark and grungy. And they are shiny! 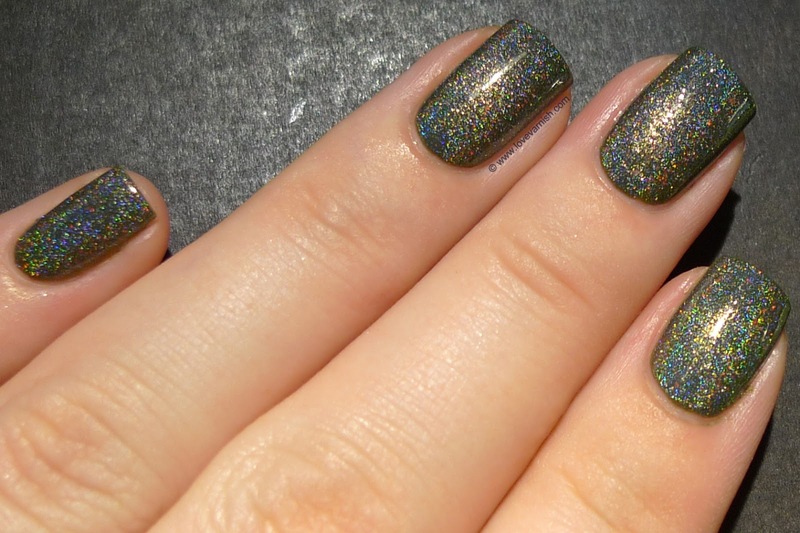 The pictures are with topcoat (doesn't dull the holo) but it was equally shiny without. It also applied really easy and evenly, no bald patches or dragging or other weird holo stuff you sometimes encounter. Do I like this polish? Yes! Was it what I expected? Not completely. But over time, more swatches will show up, and if color accuracy is the only "negative" part of this review, I think this indie is off to a great start! What do you think of this polish? And did you hear from Too Fancy Lacquer before? TFL can be found on Etsy, in the opening sale her polishes were $9,50. I payed $3 for shipping 2 polishes to The Netherlands. TFL is also on Facebook and Instagram. Really Pretty the base color reminds me of Zoya Edtya and a Diamond Cosmetics Never so ever green which now makes me want this because neither is holo! I love this color! Will have to check out the shop! I loooove this color! So gorgeous! This is still a gorgeous colour, despite not being what you expected. A lot of people have a hard time photographing polishes for colour accuracy. I even see "big" indie brands show photographs that are not accurate. This polish looks really pretty! Like it a lot! I've never heard of her before, but this holo is amazing! The base colour is unusual, I don't remember anything like that! This is my first time seeing this brand! This is absolutely stunning!!!! ♥ glad you like it dear! Yeah color accuracy is a bish, I have lots of trouble with it myself too! I hope to show the second one somewhere next week. You are welcome :D! Can't wait for the others to come in ♥. It is pretty right? I bet you'll like the other one even better since it is BLUE :D.
This one looks lovely too! And I love the name! Does it have a gold undertone to it too? No I think that's the spectraflair reacting on the slightly yellow lighting - the silver turns gold that way. Thanks Angie!